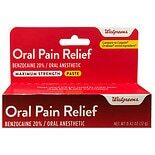 Shop Walgreens Oral Analgesic Paste Assorted (.42 oz. ).42 oz. $529$5 and 29 cents$12.60 / oz. Pain in and around your mouth can disrupt eating, speaking and smiling. Relieve pain with an oral anesthetic so that you can function without discomfort. Whether your pain is caused by cold sores or canker sores, a cough or toothache, you have options for relief here at Walgreens.com. We carry a variety of products containing oral anesthetics from brands such as Halls, Anbesol and Kanka. If you have a cough or sore throat, choose a cough suppressant with an oral anesthetic to help reduce coughing and soothe your mouth and throat. These cough drops come in different flavors, so you can choose one that tastes good to you. There is also anesthetic spray to relieve discomfort on contact. Some oral anesthetic gels are made for use inside the mouth. 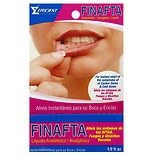 These are ideal for applying to toothaches, gum pain and canker sores. Choose between different strengths to find the treatment you need. If you have a cold sore, you want it to heal quickly. Some cold sore treatments can speed healing in addition to temporarily eliminating the pain.